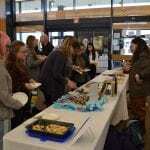 On April 1st 2019, the Jennie King Mellon Library held its 8th Annual International Edible Book Festival, co-sponsored by Chatham University’s Food Studies Program. 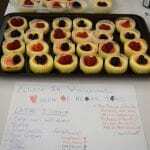 The entries were delightfully creative and absolutely delicious. 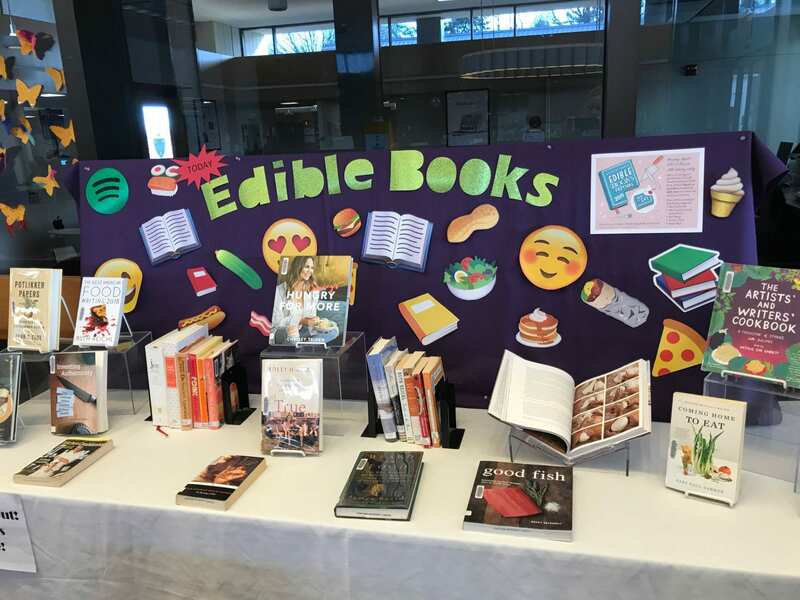 And while every year we are impressed with the Edible Book creations submitted by participants, we were extra blown away this year. 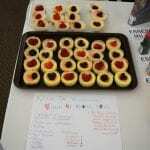 The competition was incredibly tough! 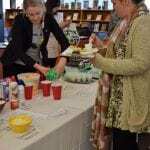 We saw 12 Edible Book creations and enjoyed record breaking attendance with over 50 folks joining us for some yummy fun! 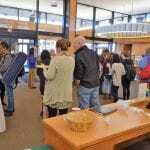 The event was held in the Jennie King Mellon Library lobby. 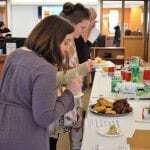 Our planning committee included Reference and Outreach Librarian Jocelyn Codner and food studies graduate student Jordan Mason, with support from Falk School Administrative Assistant Hallie Jensen. Hallie is always a huge help during the logistical planning of this event. 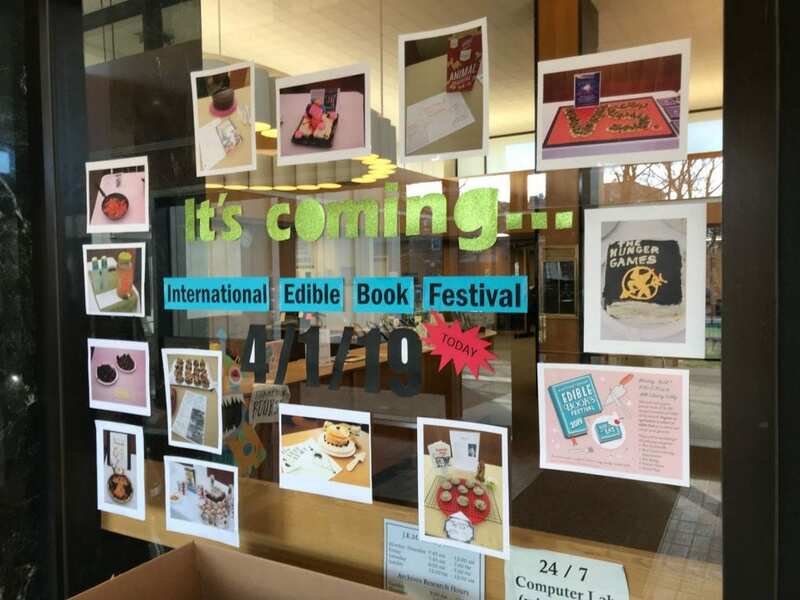 The International Edible Book Festival is an event celebrated in libraries around the world. 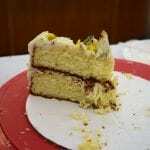 It began in 2000 by two women who wanted to combine love for literature with love for food and cooking. 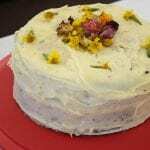 It is traditionally celebrated on or around April 1st in honor of French gastronome Jean-Anthelme Brillat-Savarin. Folks who decide to submit an Edible Book select a favorite book, or perhaps just a book that sparks inspiration, and they craft a food item or beverage that creatively interprets and represents that book! 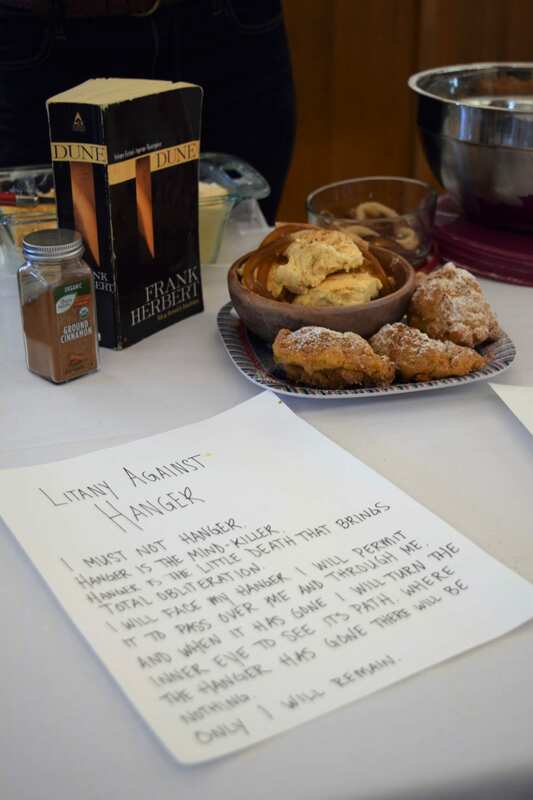 A few ways to accomplish this could be in a clever name (puns encouraged), the way the food item is decorated, the ingredients in the food item, or perhaps by featuring a particular food item that was featured in the book itself. 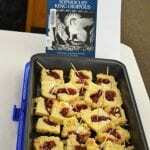 The result is fun, delicious, and literary. 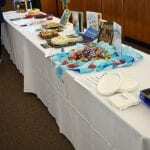 Participants bring their Edible Books to the event, and attendees and judges get to taste and judge each entry! 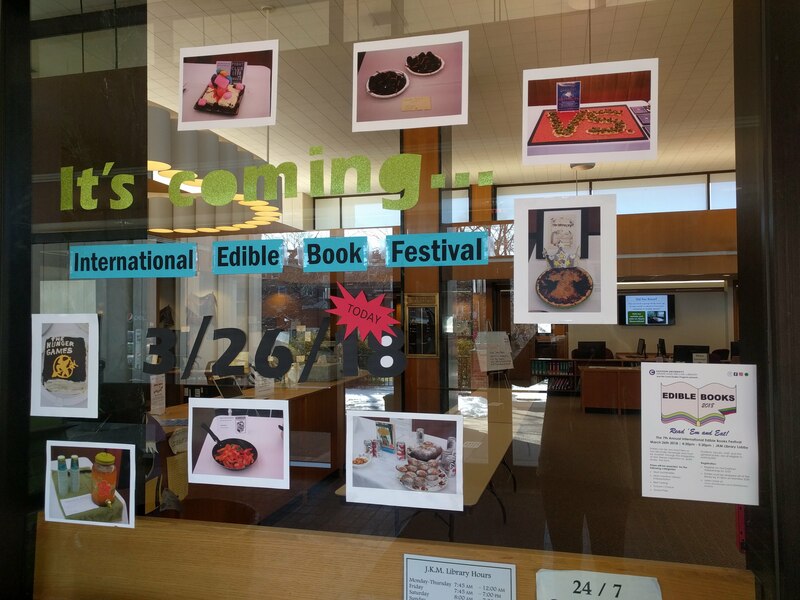 JKM Library book display featuring food writing, cookbooks, and more to celebrate Edible Books. 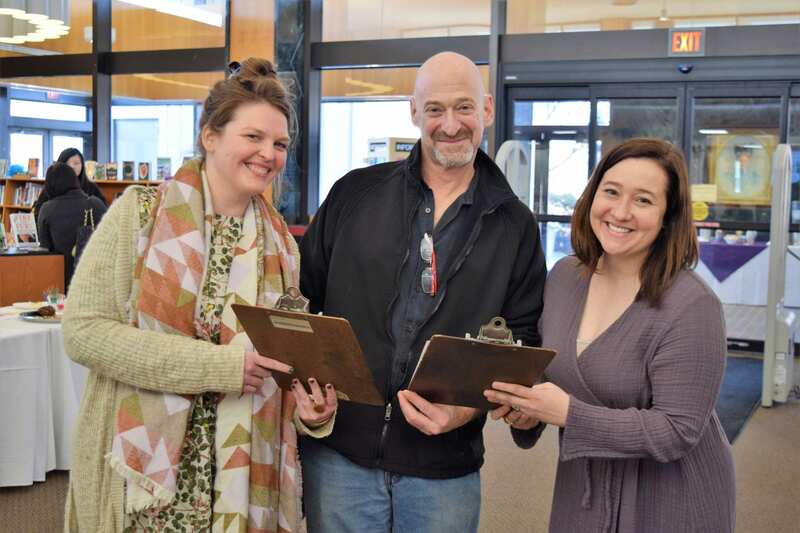 This year’s official judges included Assistant Professor Marc Nieson and Archivist and Public Services Librarian Molly Tighe, who both have volunteered to judge in previous years, and new judge Assistant Professor Sarah Shotland. 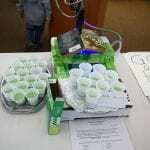 They selected the winners of Most Sustainable, Most Creative Literary Interpretation, Best Tasting, and the Grand Prize. The 50+ attendees all voted on Crowd’s Choice. 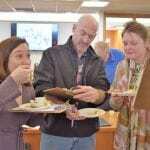 Keep scrolling to see who the big winners were and what kind of amazing Edible Books were submitted this year! 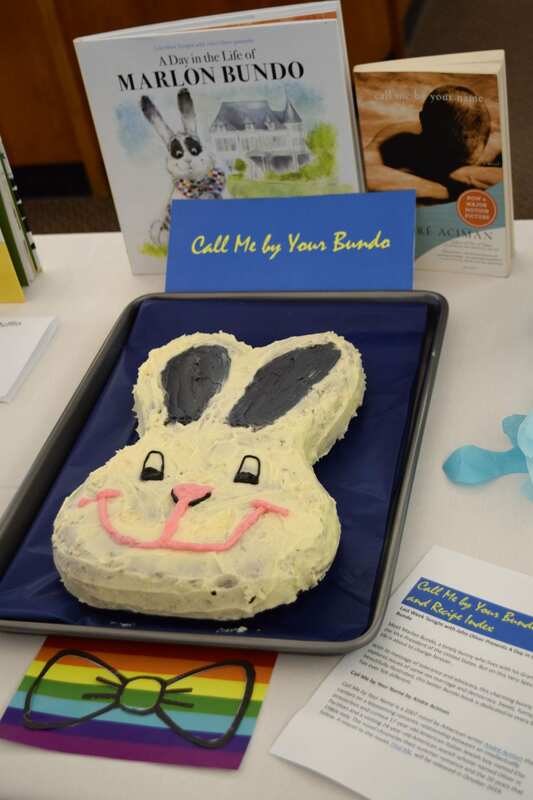 “Call Me by Your Bundo” by Erica Cohen and Sarah Fink. 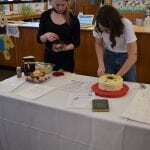 Most Sustainable Winners Erica Cohen and Sarah Fink for “Call Me by Your Bundo”. 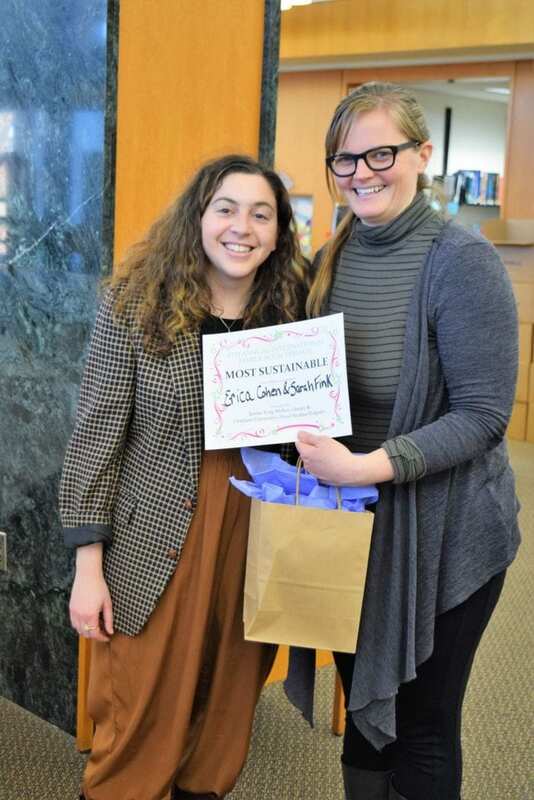 Our Most Sustainable winner was “Call Me by Your Bundo” by Erica Cohen and Sarah Fink. 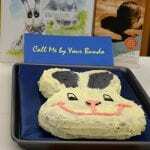 This Edible Book played off of the books Call Me by Your Name by Andre Aciman and A Day in the Life of Marlon Bundo by Jill Twiss, illustrated by E.G. Keller (presented by Last Week Tonight with John Oliver). 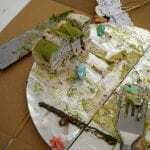 It was a playfully decorated carrot cake that won for it’s sustainable ingredients and it’s socially sustainable message. Our Most Creative Literary Interpretation was “Make Room! Make Room!” by Dan Nolting, which drew its inspiration from the book Make Room! Make Room! by Harry Harrison (later turned into the 1973 science fiction film Soylent Green). 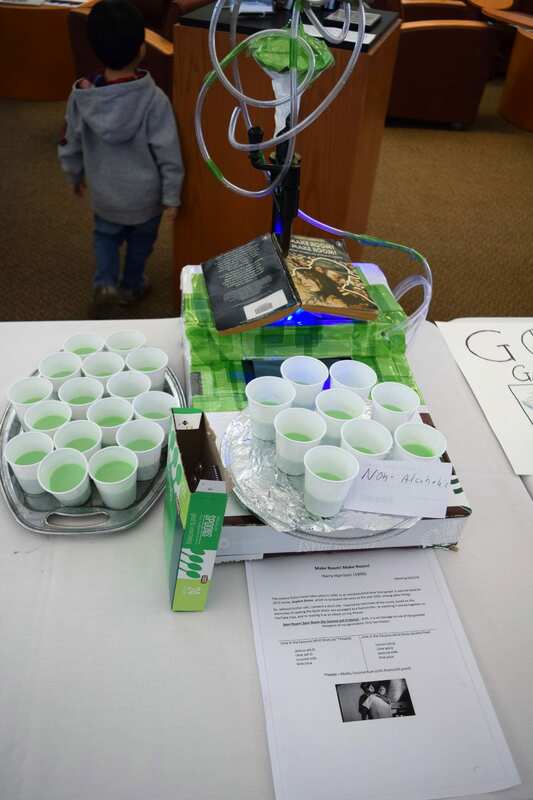 Dan created a multimedia experience with his scifi steam-punk Edible Book that included a looping video with sound to accompany his lime coconut jello shots. 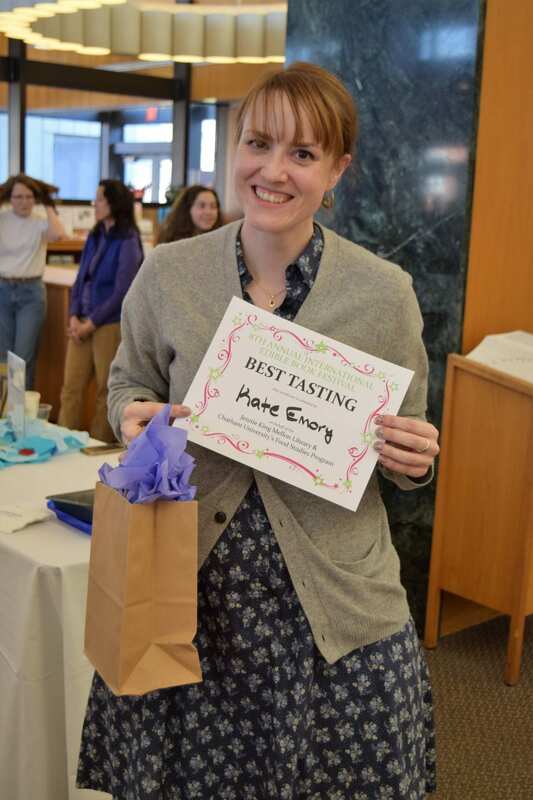 The Best Tasting award went to “Game of Scones” by Kate Emory, obviously inspired by A Game of Thrones (A Song of Ice and Fire #1) by George R. R. Martin. 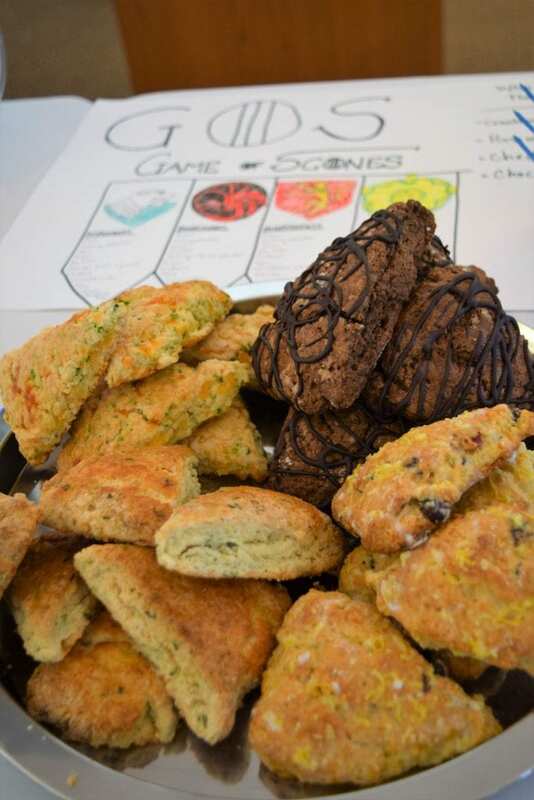 This Edible Book featured scones with four different delicious flavor profiles to represent four major families in the book series. 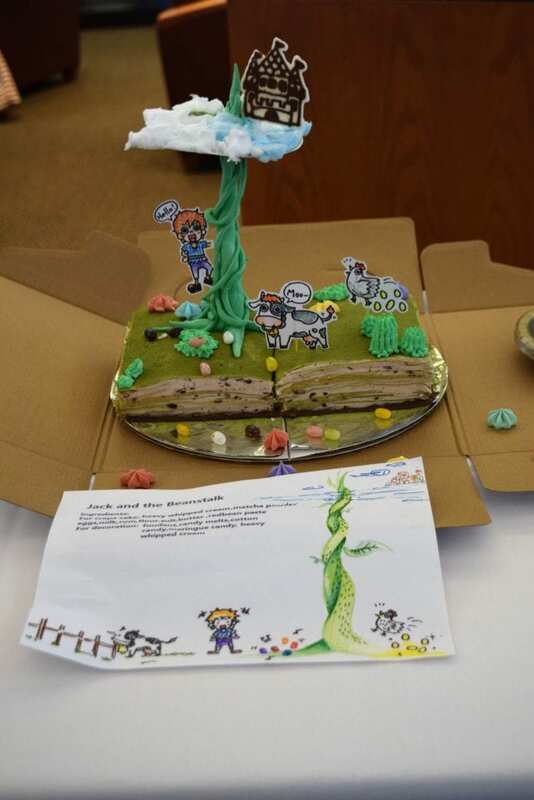 The winner’s of the Crowd’s Choice award was “Jack and the Beanstalk” by Suhui Dong and Yuchun Tung for their stunning crepe cake flavored with matcha, rum, and red bean paste decorated with candy meringues and adorable illustrations and figures. 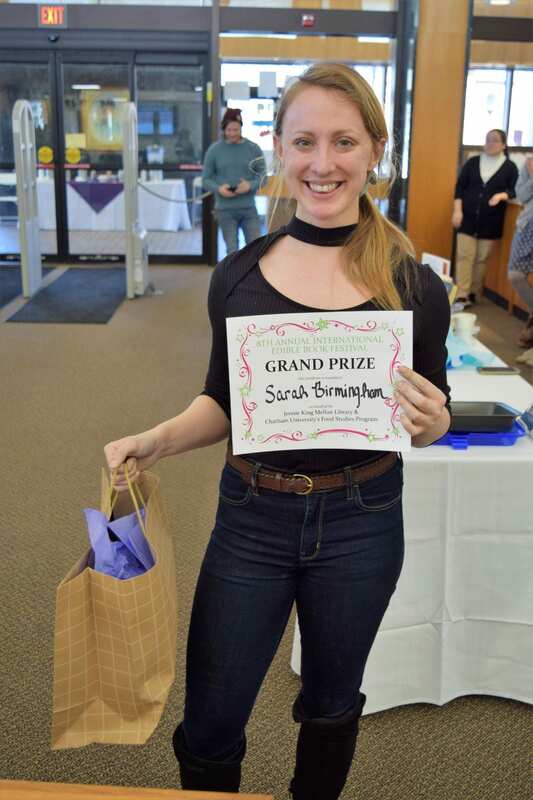 And finally, the Grand Prize was awarded to Sarah Birmingham for “Dune”, inspired by the science fiction novel Dune (Dune #1) by Frank Herbert. Sarah’s Edible Book involved handmade pumpkin sherbet (pun intended), handmade cinnamon beignets, and (most impressively) handmade chai gummy worms! 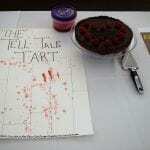 Click through the gallery to see additional Edible Book entries and more photos from the festivities! 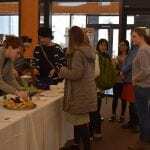 We hope this inspires you to join us next spring for our 9th Annual International Edible Book Festival. 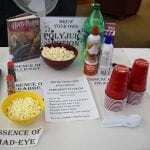 Have you ever checked out a book and noticed it was marked with a sticker that says, “Wray”? Or what about that collection of books on the small bookshelf near the elevator on the third floor marked “Olkes Collection”? Have you ever wondered what Wray and Olkes mean? 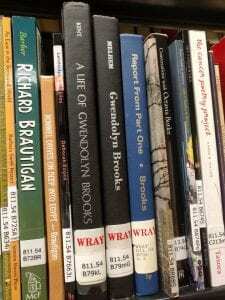 The JKM Library has, in addition to our main circulating collection, smaller collections of books that are focused on certain topics, aimed at certain age ranges, or were donated by certain people. 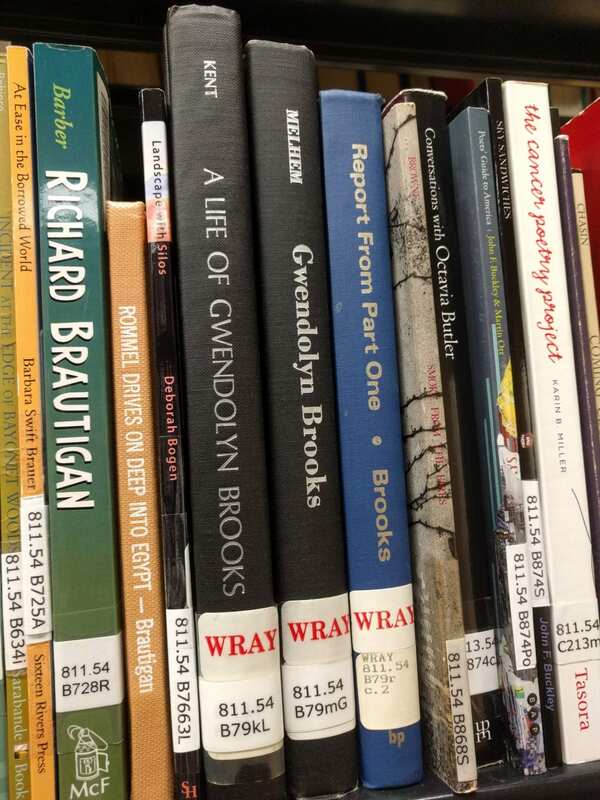 We give these collections of books different names in order to honor the person who donated the items or to make it clear that there is something special about the items in the collection. 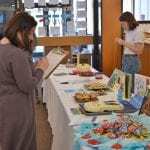 For example, our Curriculum Collection is comprised of books for young readers and includes picture books, middle-grade fiction and nonfiction, young adult fiction and nonfiction, and graphic novels appropriate for those age ranges. In the case of the Wray and Olkes collections, these are items donated by Professor Wendell Wray and Dr. Cheryl Olkes respectively. Wendell Wray, a library and information science professor emeritus at the University of Pittsburgh, was an avid book collector. The first African-American man to graduate from the then Carnegie Institute of Technology’s library science program with a master’s degree in 1952, Wray was an influential voice in the library profession. After graduation, he went on to be one of the first African-American men to be hired by the Carnegie Library of Pittsburgh. Raised in Beltzhoover, Wray’s resume includes military service during WWII and working at the New York Public Library, the Schomburg Center for Research in Black Culture, and the inner city outreach program the North Manhattan Library Project. Wray returned to Pittsburgh in 1973 to take a position as a faculty member at the University of Pittsburgh in the library school. 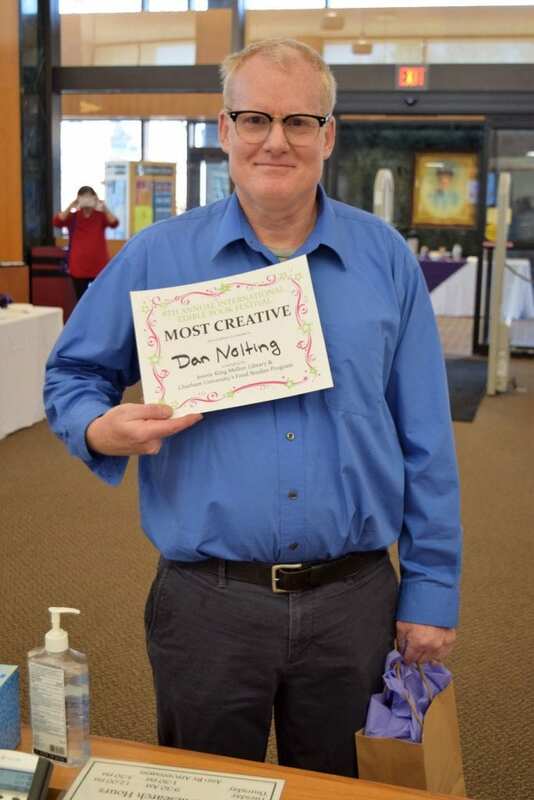 He was honored the same year with the Distinguished Alumni award from Carnegie Tech. He moved to California in 1988 upon his retirement, where he spent the rest of his life until his death in 2003. Looking for something spooky to read under the covers with some tea tonight? Look no further than Shirley Jackson, the master of creeping dread and spooky suspense. You may know Jackson’s famous short story The Lottery from high school, or perhaps you have watched the recent Netflix reimagining of her classic The Haunting of Hill House. Her works are often described as horror, but the subtlety of her writing gives it something more universal. Her themes often focus on the dark side of domestic life and isolation, and they often feature agoraphobia and critiques of the expectations of traditional society. 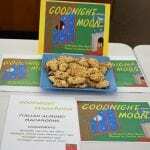 Jackson also wrote nonfiction about what it was like to be a mother and manage a home, something she considered to hold its own degree of horror. Jackson also felt that she and her family were considered outcasts in her small New England town, and they experienced anti-Semitism in the insidious manner one sees in “civilized society”. Toward the end of her life, she became so painfully agoraphobic she wouldn’t leave her bedroom. 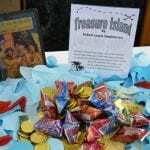 Much of what makes her fiction work horrific is because it is Jackson’s true-life experiences expressed through a fantastical lens, and as such there is something recognizable in it to all of us. We see how easy it could be for us to slip into some kind of madness, or for the precarious society around us to suddenly turn vicious. It is not gore or jump scares that make Jackson’s work terrifying, it is how she exposes the truth and ugliness in us all. For this fall, I wanted to recommend a lesser talked about Jackson classic: We Have Always Lived in the Castle. This short (under 200 pages) novel is dark, twisted, unconventional, and incredibly beautiful. 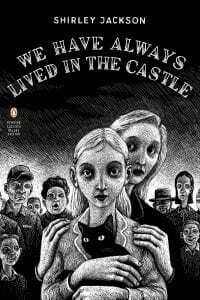 We enter into the lives of Mary Katherine (Merricat) and Constance Blackwood, two young women who live isolated in their large house with their wheelchair-bound uncle, Julian. The fractured family fell into disrepair after arsenic in the sugar bowl killed the rest of the Blackwoods half a decade ago. 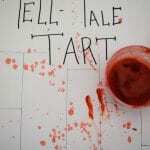 The only two who were not poisoned in the incident were Merricat and Constance, while Uncle Julian did not ingest enough of the poison to kill him. Constance, having been put on trial and then acquitted of the crime, now suffers from such extreme agoraphobia that she cannot leave the house. Uncle Julian is so much diminished from the poisoning that he struggles to keep one foot in reality. He depends on his nieces to care for him, which they do lovingly. The town is happy to keep them isolated, making disparaging comments and singing a haunting little nursery rhyme about the murders whenever Merricat comes near. And it is only ever Merricat that leaves their extensive grounds to go grocery shopping and run quick errands. 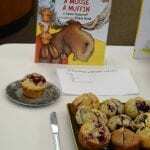 7th Annual International Edible Book Festival: Read ‘Em and Eat! 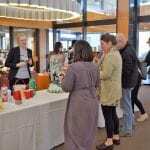 Another year, another AMAZING Edible Book Festival! 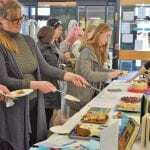 The International Edible Book Festival is a celebration of food and literature, combining both into tasty fun! 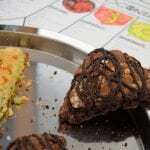 This year, we had an incredible variety of sweet and savory dishes ranging from cleverly simple to technically impressive. 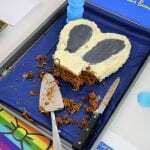 There was also liberal usage of props, much to our delight! It was exciting, to say the least. 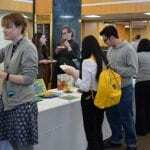 The event was again co-sponsored by the Food Studies Program and hosted in the Jennie King Mellon Library lobby. 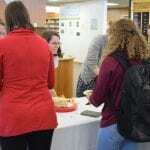 Our planning committee included Reference and Outreach Librarian Jocelyn Codner and Food Studies students Lore Pinder and Rachel Waugh. 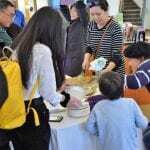 Participants select a favorite book, or perhaps just a book that sparks inspiration, and they craft a food item or beverage that creatively interprets and represents that book! 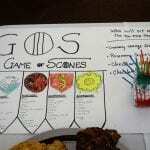 A few ways to accomplish this could be in a clever name (puns encouraged), the way the food item is decorated, the ingredients in the food item, or perhaps that particular food item was featured in the book. 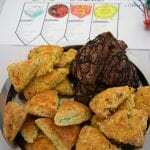 The result is a fun and delicious Edible Book. 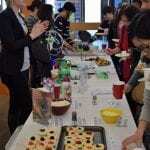 Participants bring their Books to the event, and lucky attendees get to taste and judge each entry! 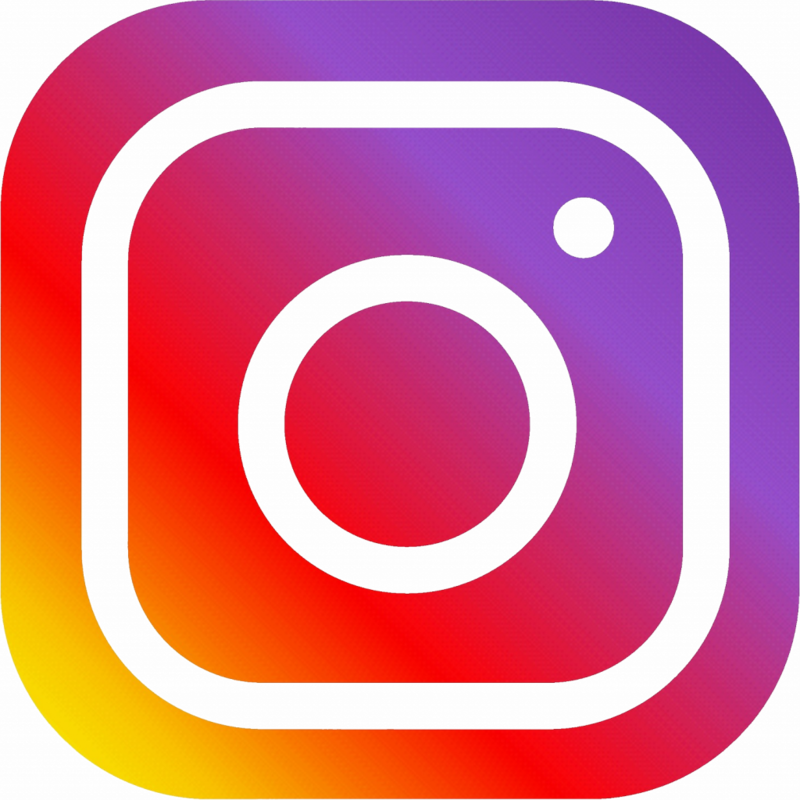 There are so many opportunities to connect and interact with the Jennie King Mellon Library online and in person, and we recently added two more: Instagram and Spotify! Our new Instagram account (@jkmlibrary) features library news, updates, and shenanigans. Be sure to follow us for #NewBookTuesdays and #BookfaceFridays. 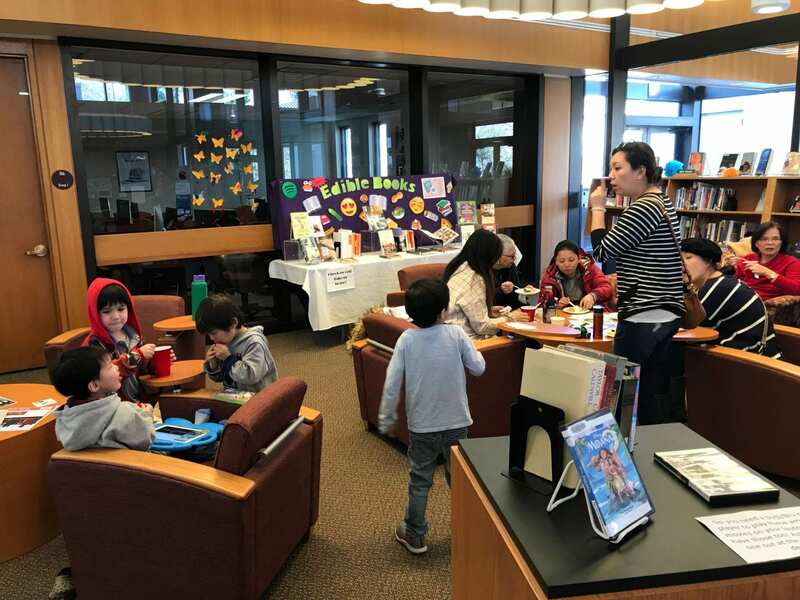 You’ll also get to know our staff and librarians better, as we post fun pictures of our recommendations, displays, and exciting library life. And yes, you heard correctly, the library has a Spotify account. What is Spotify? It’s a music streaming service that allows those with accounts to listen to over 30 million songs for free and create and share playlists. 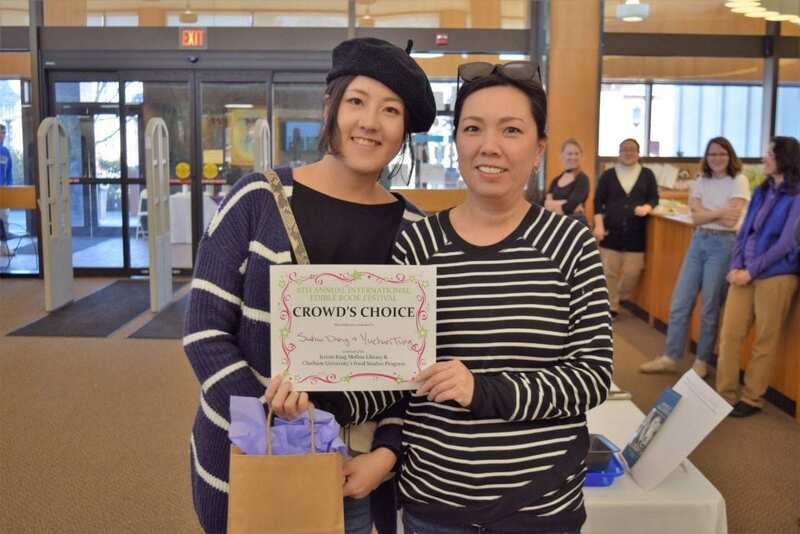 Library staff members love music of all genres and styles. 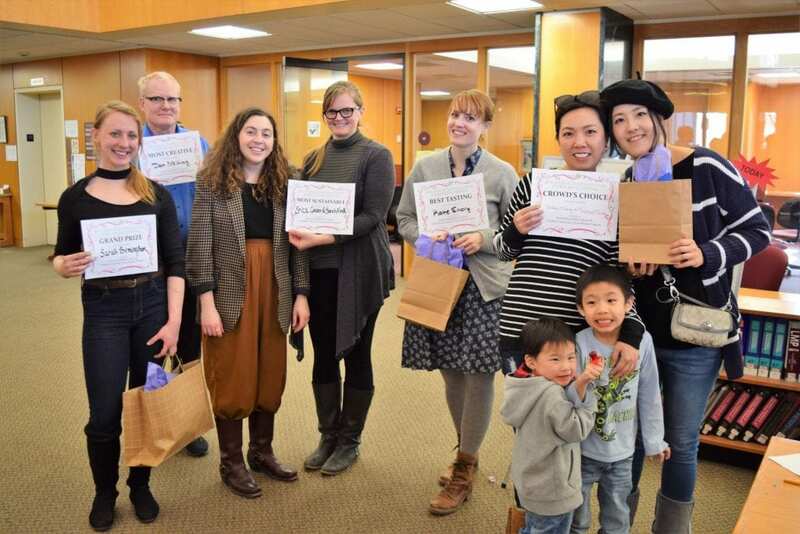 We’re hoping to share our love of music with the rest of the Chatham community in a way that enhances your experience at the library and allows you to get to know us better. 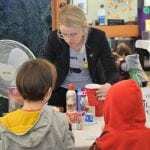 Our playlists are specially crafted by librarians and library staff, and while they are certainly educational, they’re also a lot of fun. We create new playlists regularly for different purposes. 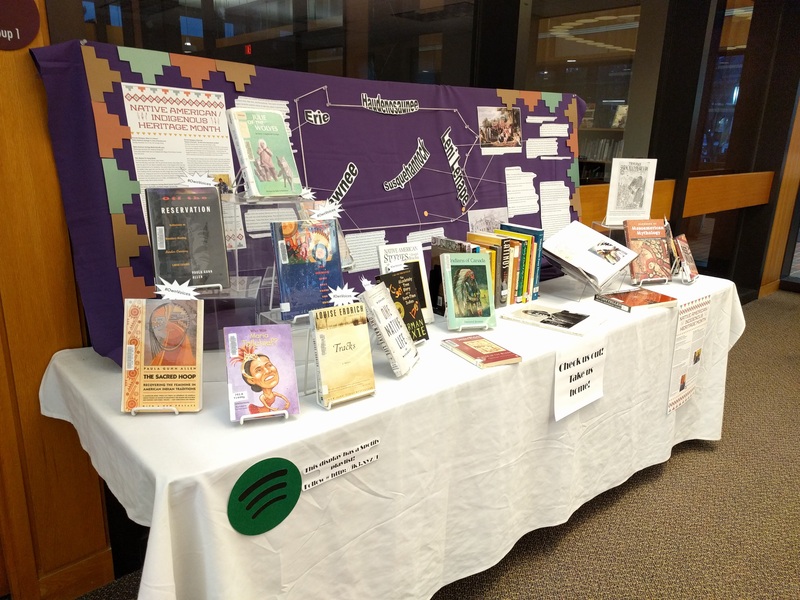 A playlist could correspond with one of our in-library displays, be a Staff Spotlight playlist of recommendations put together by just one staff member, or something that our student workers have crafted! 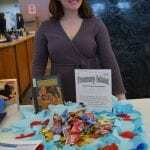 Our Native American Heritage Month book display is on the first floor of the JKM Library. 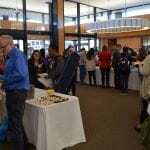 Every year, Chatham University chooses a Global Focus, and the 2017-2018 school year is the Year of Indonesia. In order to highlight Indonesian culture and society, the JKM Library has partnered with Dr. Greg Galford on displays that celebrate Indonesian culture and help educate our Chatham community. 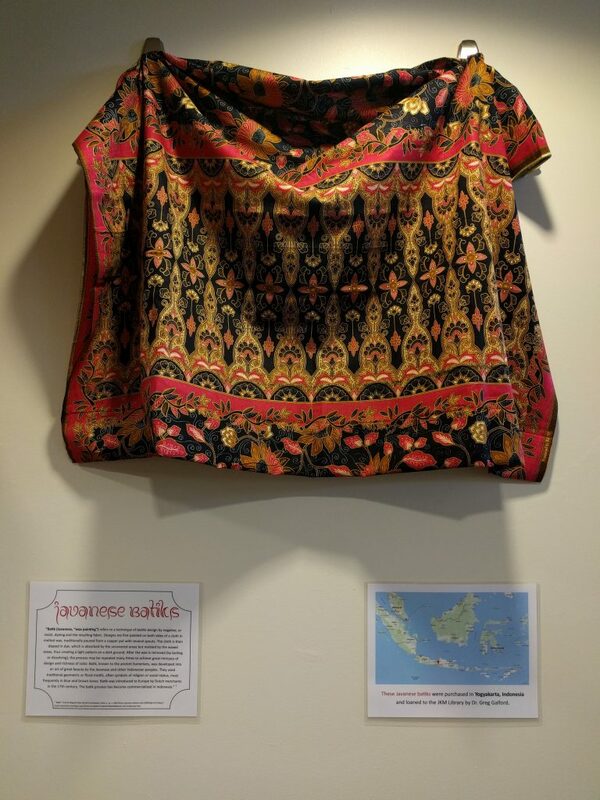 The first is a display of beautiful Javanese batiks purchased in Yogyakarta, Indonesia by Dr. Galford. Each of the batiks on display are incredibly beautiful, but one in particular features golden wax detailing that is truly stunning. 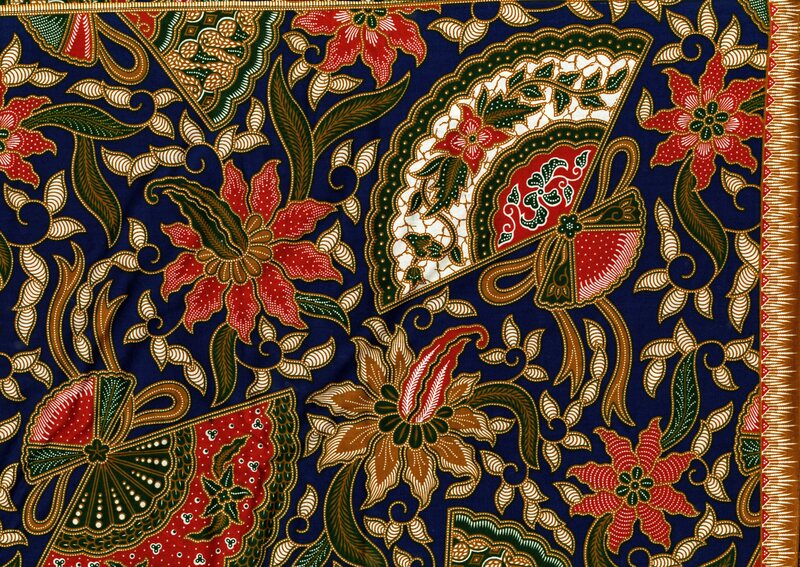 The batik has been the source of some controversy over the years concerning the appropriation of Indonesian culture by many of its neighbors. A 2009 New York Times article detailed the struggle for cultural ownership of the batik between Indonesia and Malaysia. This was just one of many conflicts between the two nations. 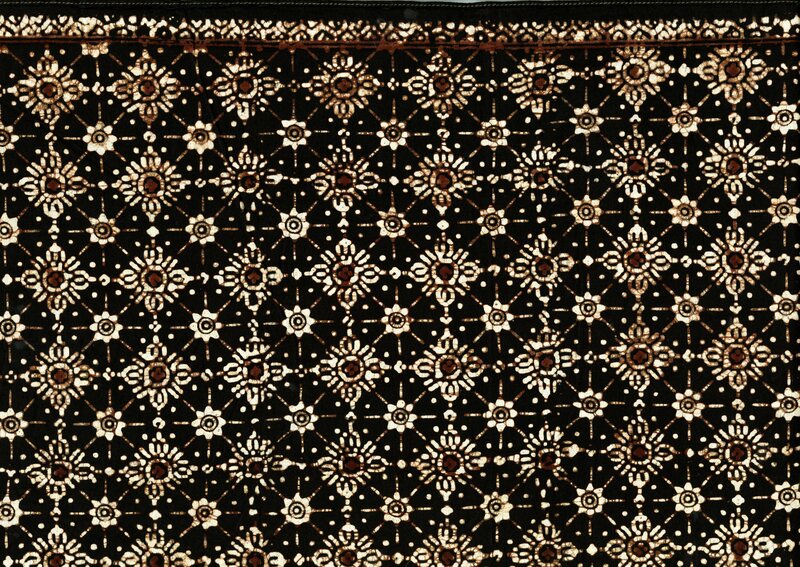 In September of that year, the United Nations Educational, Scientific and Cultural Organization, known as UNESCO, made the decision to add the batik to its Intangible Cultural Heritage list, meaning that its cultural meaning and significance is now protected and attributed to Indonesia (Gelling, 2009). The process includes drawing beautiful designs on fabrics in hot wax which then helps to control which part of the fabric accepts the dyes and colors. This process is repeated on the same piece of fabric until the desired design is achieved (Indonesian Batik, 2017). The results are breath-taking. You can see video examples and up-close images of this process on UNESCO’s Intangible Cultural Heritage website. In another article by the New York Times that discussed the attempts to revive the batik tradition in the 1990s, batik historian T.T. Soerjanto explains how the tradition dates back 2,000 years and was first mentioned in the 15th century in the court records of Pakubuwono V, the King of Solo (Rabin, 1990). Take a look at the detailed fabric scans below of some of the batiks we have on display. 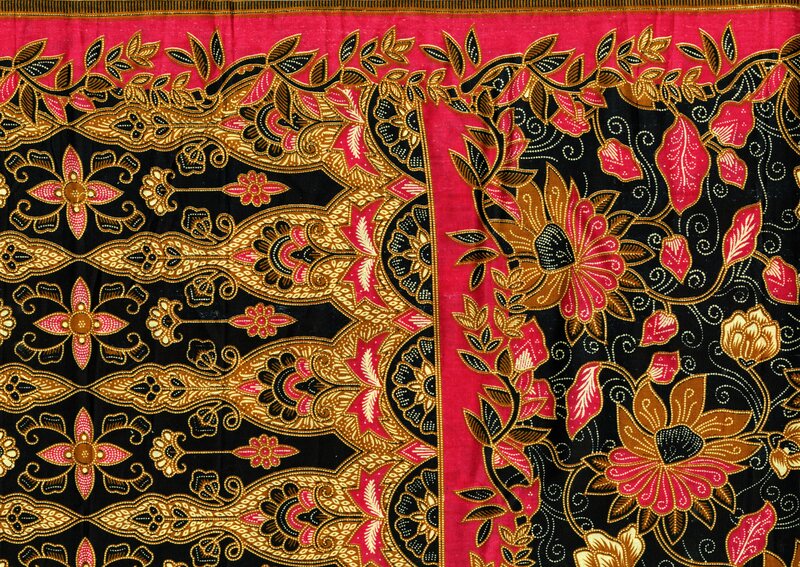 Come in person to see our gilded batik in all its glory. 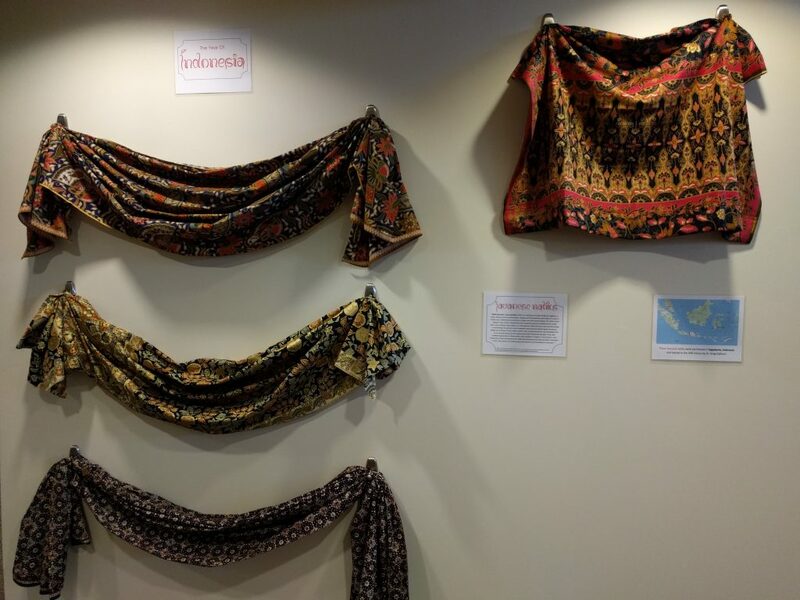 You can find our batik display on the first floor of the library hanging on the wall partition near the elevator. Feel free to get up close and even touch the fabric, but please proceed with care. 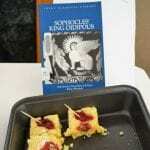 The second display is a collection of 18 books on Indonesia, provided by Dr. Galford. These books, which are both fiction and non-fiction, range in topic from history to civil engineering and infrastructure. While you are more than welcome to enjoy these books in the library, please do not remove them from the building. Below is a full list of titles in case you are interested in finding a copy for yourself! We hope you enjoy Chatham’s Year of Indonesia! Take a moment to view our displays the next time you find yourself on the first floor of the JKM Library.